This solution is now officially distributed by Microsoft! "Microsoft is offering the Local Administrator Password Solution (LAPS) that provides a solution to the issue of using a common local account with an identical password on every computer in a domain. LAPS resolves this issue by setting a different, random password for the common local administrator account on every computer in the domain. Domain administrators using the solution can determine which users, such as helpdesk administrators, are authorized to read passwords." In this post I outline a step by step guide on implementing the solution. This post builds on the previous one. This is mostly a condensed version of the author’s documentation with addition of some items that either I found unclear or were not covered by the author. WARNING: The solution requires schema extension and this should never be taken lightly so do test properly and proceed at your own risk. The steps described in this section can be carried out on a Domain Controller or a management workstation. Note: I tested this on a domain with a local GPO store. If you are using a Central Store you should check if the templates have been copied. The following to steps are required for Windows 2008 and 7. Windows 2012 comes with .Net4 installed and enabled. This permission is not granted by default, you should however ensure it has not been granted manually as this would give access to the stored passwords. Go to “Permissions” tab and click “Advanced”. You should also ensure that permission inheritance is enabled on sub-OUs. In this step we grant permission to retrieve passwords from AD. See the previous post for more details. Firstly you need to create a group which you will use to grant access to retrieve passwords. In this step we grant permission to force password reset . The GPO needs to be linked to the OU containing accounts of the computers you want to manager. You don’t configure any settings in the GPO. The magic happens in the next step. The cmdlet accepts displayName, GUID or DN. This is all configuration that's required server side. Now we need to deploy the CSE to computers we want to manage, and configure password requirements (see the previous post for and the documentation for details). Jiri Formacek, a Microsoft Services consultant (based on his LinkedIn profile), has published an excellent local admin password management solution. The solution uses Group Policy Client Side Extension (CSE) to set random and unique per computer local administrator password that is changed at a user controlled interval (30 days by default). The password is then stored in a confidential Active Directory (AD) attribute. Permission to retrieve the password is controlled using a security group. The solution is described in the documentation so I won’t be repeating what’s there. I’ll go over the main points and some stuff that’s not covered in the official documentation. I recommend reading the documentation. Implementation requires AD schema extension in order to create two new attributes and add them to the computer object class. The attributes are marked as confidential so the authenticated users group cannot read the values. Access to the attributes is controlled, with a security group. I used two separate groups. One group with read access to the ms-MCS-AdmPwd attribute for retrieving the passwords and the second one with write permission to the ms-MCS-AdmPwdExpirationTime attribute allowing for forcing the reset. In most cases it would be the same group performing both, however I prefer to have an option of separating the tasks. Permission can be granted per OU so you can further subdivide the access. For example based on geographical location. The passwords can be retrieved using “AD Users and Computers” and ADSIEDIT consoles. Also, the author provided a GUI tool that can be used to easily retrieve admin passwords. The tool is installed along with the management tools. The Client Side Extension (CSE) is a DLL file that needs to be deployed to and registered on managed computers. A convenient MSI file is provided. It can be deployed using your standard package management tools such as SCCM, Altiris or Group Policy. The management tools (Group Policy Template, PowerShell scripts, and the GUI tool) are installed using the same MSI. Only the CSE needs to be installed on the managed computers. The CSE is configured using the provided GPO template. 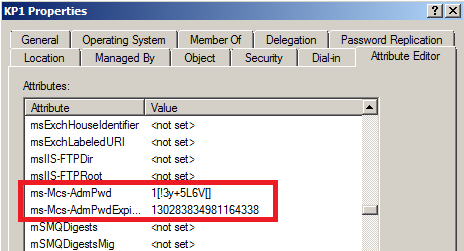 The CSE has an event log provider that logs to the Application Log. This is detailed in the documentation. I found it useful to set the logging level to the highest during testing. Summarizing, I find this solution to meet all requirements. I have tested it on a 2012 AD with Win 7 clients and 2012 member servers as well as 2008R2 AD with Win7 and XP clients. I think this is an excellent solution. A potential concern one may have is that the passwords are stored in clear text in AD directory partition. However, an attacker would have to obtain a copy of the AD database and extract the passwords offline. If an attacker, a malware or an evil insider gains access to a single machine currently logged on under the local admin account they will be able to access all machines by executing a script or using built-in management tools. Moreover, compromise of a single machine will allow an attacker to grab a password hash and use it to access other computers. Summarizing, GPO Preference is not a good solution. Windows OCSP client requires that the OCSP responder URL is populated in the AIA extension. If it is not included, Windows will not form the OCSP request properly and the validation will fail with Certutil status of "Unsuccessful". The same certificate was successfully validated by a Cisco ASA OCSP client. This does not seem to be the case in Microsoft's implementation. OCSP responder address is specified in the Authority Information Access (AIA) extension. In Windows CA, this is configured in the properties of the CA on the"Extensions" tab. Once configured all newly issued certificates will include the OCSP responder address. Without the OCSP extension validation using certutil fails. According to RFC2560, an OCSP request must specify hashing algorithm, issuer name hash, issuer key hash and serial number of the certificate to be validated. issuerNameHash is the hash of the Issuer's distinguished name. The hash shall be calculated over the DER encoding of the issuer's name field in the certificate being checked. IsuerKeyHash is the hash of the Issuer's public key. The hash shall be calculated over the value(excluding tag and length) of the subject public key field in the issuer's certificate. The hash algorithm used for both these hashes, is identified in hashAlgorithm. serialNumber is the serial number of the certificate for which status is being requested. If the AIA extension doesn't specify the OCSP URL Windows client does not include issuer's key hash in the request. In this case the responder returns an error of "unauthorized" and the validation fails. The response "unauthorized" is returned in cases where the client is not authorized to make this query to this server. Extensions are used to associate additional information with the user or the key. Criticality flag specifies whether the information in an extension is important. If an application doesn't recognize the extension marked as critical, the certificate cannot be accepted. If an extension is not marked as critical (critical value False) it can be ignored by an application. Extract from RFC "Internet X.509 Public Key Infrastructure - Certificate and CRL Profile"
value encoding system for each element. extension may be ignored if it is not recognized. cached version rather than downloading an updated CRL or submitting a new OCSP request. defines when cache will be cleared.